Photographed at Ship Rock, Catalina Island using a Nikonos V and 15 mm lens exposed at f-11 with no strobe. Photographed at Farnsworth Banks, Catalina Island using a Nikonos V, 15mm lens and one Ikelite Substrobe 150, full power, exposed at f-11. About the Purple Coral: Found in waters from 50 to 65 degrees along the California coast. Grows in large clumps and is illegal to collect. Found from 30 to 200 feet plus. 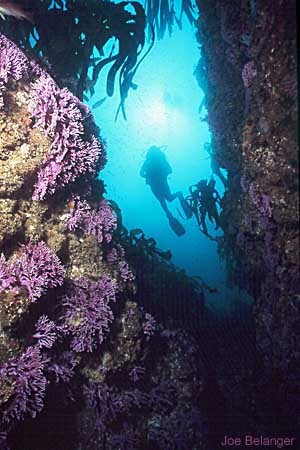 Photographed at Eagle Reef, Catalina Island using a Nikonos V, 15mm lens and no strobe. Exposed at f11. 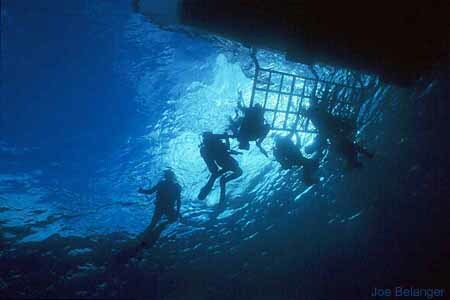 On all dive boat occasions, divers have the pleasure of huffing themselves up the ladder to a somewhat dry and safe deck. 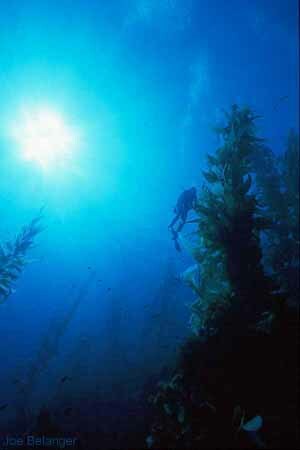 Photographed at Cortez Banks about 100 miles off the coast of San Diego using a Nikonos V, 15 mm lens and available light. 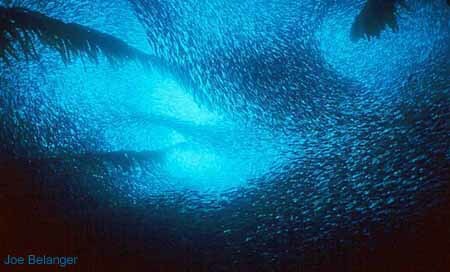 About the School: We had a blast with this school of fish. They arrived with an acoustic beat of the tail. We could hear the flaps of their fins fluttering in the water....when a shark or sea lion darted in for a meal, we heard a big "thump" which was the syncromonius beat of the fishes' tails reacting against the water. The school was at least a mile in overall diameter, and 70 feet thick....they were near the bottom at 75 feet and filled the water column all the way to the surface...we could feel them bouncing off our fins.